During ancient times, Roman and Greek civilizations used nutmeg as a type of brain tonic. This is because nutmeg can effectively stimulate your brain. It contains a natural organic compound called myristicin, which is known to shield your brain against degenerative disease such as Alzheimer’s. As a result, it can help eliminate fatigue and stress. Nutmeg can also improve concentration to become more efficient and focused at work or at school. If you are suffering from anxiety or depression, nutmeg may also be a good remedy. If you suffer from digestion-related problems like diarrhoea, constipation, bloating, and flatulence and so on, nutmeg can effectively offer you relief. Nutmeg oil relieves stomach-aches by removing the excess gas from your intestines. Nutmeg can also boost your appetite. It is used in small dosages to reduce flatulence [excessive stomach or intestinal gas], aid digestion and improve appetite. 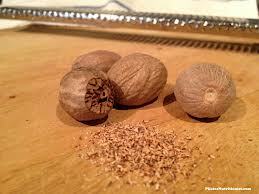 Drops of nutmeg oil can also be mixed with honey to treat nausea, gastroenteritis, chronic diarrhoea and indigestion. To relieve diarrhoea, drink a filtered mix of 1/4th teaspoon of ground nutmeg, 1 teaspoon of ground coffee in one cup of water. Because of its antibacterial properties, nutmeg can also effectively treat halitosis or bad breath. As you probably know, bad breath is usually caused by a build-up of bacteria in your mouth. Nutmeg can ride your mouth of these bacteria. This is the reason why nutmeg is a common ingredient in many brands of toothpastes. Nutmeg oil is used to treat toothaches. Drops of essential oil are put on cotton swab and applied to the gums around an aching tooth. If skin care is one of your priorities then you might want to incorporate nutmeg into your regimen. Nutmeg can actually help you achieve smoother and healthier skin by helping you treat several skin problems. A scrub made from nutmeg powder and orange lentil powder can help you remove blackheads, a type of acne characterized by pores clogged with excess oil and dead skin cells. If you suffer from acne marks, nutmeg can also help make your scars less noticeable. What you need to do is mix some nutmeg powder with some honey to make a paste, which you will then apply to the acne marks.or grind 2 – 3 nutmeg seeds and add little milk to make a paste. After washing the face with warm water, pat it dry, and then spread the paste evenly over the acne. After two hours, use warm water to remove the paste, followed by cold water to close the pores. This paste also acts as a scrub to treat blackheads. If you have difficulty sleeping at night, drink one cup of milk boiled with 1/4th teaspoon of ground nutmeg. This will help you achieve relaxation and will induce sleep. Like cloves, nutmeg contains eugenol, a compound that may benefit the heart. Nutmeg can help to combat asthma. It is also used to relax muscles. To calm chest cold, make a paste of nutmeg powder and flour with water. Cover the cotton cloth with paste and apply to the chest. Nutmeg should be used in moderation—a pinch or two is considered safe. However, large doses can trigger an acute psychiatric disorder. It contains myristicin, which in large doses can cause hallucinations. Users may feel a sensation of blood rush to the head or a strong euphoria and dissociation. It can also lead to convulsions, palpitations, generalised body pain, vomiting, nausea and eventual dehydration. Followed by long, deep almost coma-like sleep, it can even cause death. Pregnant women and nursing mothers should avoid the use of nutmeg. It can cause miscarriage in pregnant women. It also inhibits prostaglandin production [involved in child birth process] and contains hallucinogens that may affect the foetus, if consumed in large quantities. It can also trigger dizziness, nausea and difficulty in urination. Touching nutmeg can cause allergic skin reaction. It should be kept out of reach of children and pets.